Playing Faery’s Tale with the kids! We are back with Day 2 of Teach Your Kids To Game Week. The first night we played Hero Kids and had a great time. Last night, we played Faery’s Tale and the kids were excited as we gathered around the table. I had been telling them about the game as we were riding home from picking up dinner and my daughter could not wait to play an actual faery. This time I had character sheets printed off and we started with character creation right away. Each of the kids picked one of the four faery types from the book. Let’s talk a brief moment about the rules and character creation. Faery’s Tale uses 3 attributes, Body, Mind, and Spirit that you use as your dice pool for different checks. Each type of faery has base stats, and you get to choose were to put 3 additional points. Then you have the faeries gifts. Each faery begins with 2 gifts, and they get to choose 5 points more worth of gifts. There are various different ones that do anything from giving them a sidekick, to increasing their Body stat when making tests against strength. Each one costs a little different. Each faery also has Essence, which is kind of like their magical life force. They use it to perform magic that changes the story, but it also acts as their health. When they run out, they fall into a deep sleep to restore it. For the mechanics, you are rolling D6’s if you have 3 mind, then you would roll 3 D6 and ignore the odd dice, and count the even dice as successes. The amount of successes determine if you overcome the check or not. You can also have duels which work basically the same. Essences are used to change the story by casting powerful magic or such and they can also be awarded to the faeries by the GM when they accomplish things, or act as a good faery, or so on. I like this mechanic as it reminds me of Awesome Points and Bennys in other games. So, back to the kids characters! Lauren (7 year old) picked the pixie, which can fly and has pixie dust magic as her starting gifts. She added her additional points to Spirit and Mind, then bought the additional gifts of Magical, Sneaky, and Magical Music. She loves magic and always wants to cast spells. She named her faery Dessa. Logan (5 year old) picked the sprite, which has no magic but gets the starting gifts of Champion and Animal Friend. Sprites are like the warriors of faeries. He added his additional points to Body and Spirit, then bought the gifts of Brave, Strong, and Sidekick, which allowed he to choose a creature or faery that stuck by him. He chose a Pseudo Dragon decided that he could ride the dragon in order to fly like Lauren. He named his faery Forrest of the Woods. With characters finished, we jumped into the story. I used the example story of Jack and the Beanstalk from the book. They recommended as a good entry point for new players, and my kids seemed to like and not really recognize it so much from the cartoons and such. The faeries woke up in Brightwood Forest and gathered in the glade. At this point I had them talk to each other as the faeries, which was quite fun. Then I them notice a giant beanstalk growing up above the trees that they were sure was not their the day before. I asked them what they wanted to do and Logan immediately jumped up and said, we need to investigate it! (I love that I did not have to prompt them to do that.) So I had them roll their first check to see if they knew where the beanstalk might come from and Lauren figures out that it might be coming from the human village close by, she tells this to her two companions and they are off! In the village, they see that the beanstalk is growing out of the garden by Jack’s house! Jack is a young boy and friend to the faeries. His mother is outside with a group of villagers and she is saying that Jack is gone and asking anyone to help. All the villagers are two scared and they leave. The mother is frantic! At this point, Lauren says she wants to calm the mom with a musical song. I am impressed and say sure, but to calm a human, she is going to need to spend an Essence. She doesn’t really want to do this, but does so and calms the mom down. I ask them what they want to do now and Logan says that they must help her and find Jack. I award them all with an Essence for acting like good faeries. I tell them that most humans do not believe in faeries, so how do they want to approach her. They decide to let her know it was their music she heard and that they know and want to help Jack. She is thankful and offers a favor if they can get him back. Now I ask how they want to get up the beanstalk. Lauren can fly, Logan rides his dragon, and Levi turns into a wasp to make the trip. They all ascend up the beanstalk and through the clouds without trouble. On top of the clouds they see a giant castle, much bigger than any human house. With a successful mind roll, Logan tells them that knows this must be a giants home. They also see a large gate and fence blocking their path forward. Asking them what they want to do, Logan wants to try to left the gate. I warn him that it looks larger than heavier than any gate he has seen before, but he wants to attempt the task. I tell him he needs 4 successes to do it, and he rolls, falling short of the goal. I have him show us how it goes and he tries to lift the table to show them that he cannot do it. Lauren wants to turn the gate into a magic gate using her pixie dust, then play it music so it will like them and open. I tell her that sounds good and have her roll. She succeeds and I grant them all Essences for overcoming this obstacle. Now inside the gate, I ask them how they want to find Jack and Lauren wants to cast a spell to locate him. She gets enough successes and sends a little ball of energy into the castle that comes back and tells her jack is in the kitchen, through an open window. They decide to fly up to it, this time with Levi turning into a bee! They see jack in a cage hanging by the fireplace and can hear the loud snoring of a giant! The faeries fly up to the cage and Jack is happy to see them. He said the giant is going to eat him for dinner after his nap and to please get him out. He tells them the key to the cage is around the giants neck. Lauren decides she wants to try to cast a spell to create the key. I tell her it is a huge key and that she would need a heroic success to overcome this obstacle, or that she can spend 5 Essences to change the story. She did not want to spend the Essence did not like spending Essences at all, so she rolled. She only came up with three successes, and she decide to spend two Essences to make up the difference. She grew a key out of wood and used it to free Jack! I awarded her an Essence for this. However, when Jack got free shouted in joy and woke the giant. The giant comes out and he is huge, I ask them what to do and Logan says he wants to fight him! I tell them that Jack is terrified and just wants them to take him out, but Logan and Lauren still want to fight. (At this point I stopped and explained to them how big the giant was compared to them. They didn’t quite understand until I told them that He was about my size, and they were about the size of a bug. I asked them what they did to bugs…and they replied squish them. I then asked what they thought the giant might do to them since they looked like bugs. It dawned on them here and they realized that maybe they should run instead!) They wanted to trick the giant before they ran. Logan shouted at him that he was Jack and jumped on his dragon to fly and lead the giant away from Jack and Lauren. Lauren cast a spell on Logan to make many illusions of him so that the giant wouldn’t know which one to squish. Then they all ran. Lauren and Jack made it out the gate and they waited by the hole for Logan. Finally Logan came flying on his dragon through the gate with the giant close on his tail, having already squished all his illusions. The gate closed behind Logan and the giant tried to open it but the gate (still enchanted by Lauren’s pixie dust) demanded a song to open. This confused the giant and they escaped down the beanstalk. Jack reunited with his mom and the mom offered them a favor if they ever have need. My daughter then ran over to mom and gave her an entire recap of the game, telling her how awesome it was. 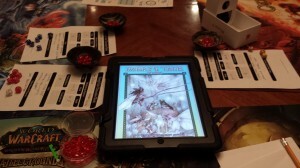 It was a great night of faery tale fun and I would also have to give the game a good rating. It was a little bit tougher to jump right into, but I think after running it once I could easily run it again. I would definitely recommend it and I just downloaded a free adventure from www.firefly-games.com for the game. I encourage you to go there! We will be playing again. I also give the game 5 stars. For Day 3, I believe we will be playing Little Wizards! Until then happy gaming!